Register Log In Home Page Forums MAME Husky Hunter 2 file transfer tutorial. Figured it might a good idea to do a tutorial on how to get files onto the Husky Hunter 2. Since the Hunter's OS (DEMOS) is somewhat CP/M 2 compatible, it is possible to run some CP/M-80 software on it. I'd recommend extracting the floppy image from the zip, and using that, since floppies within zipfiles are read-only, which prevents HCOM from changing settings. Or you could copy the HCOM files to an HD image for faster access, it's your choice. For this tutorial, we'll use the DOS version running from the floppy disk. 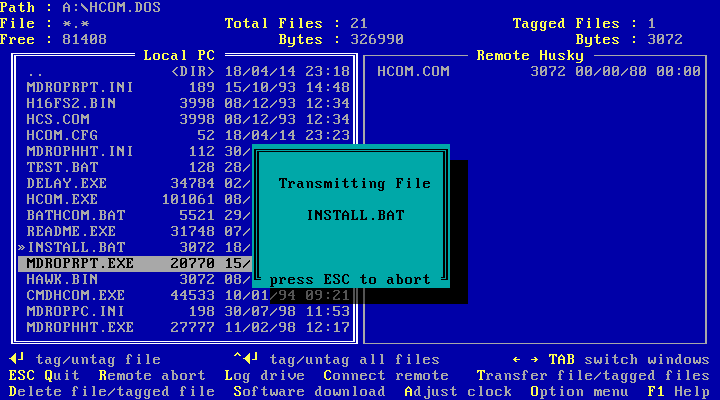 Transfers are done by connecting a PC to the Hunter via a null modem cable, and running software on both to facilitate data transfers. Since with MESS, this will require running two instances at the same time, it will be helpful if you have a multi-core CPU. Run any AT PC driver in MESS (at386 will do), with the software floppy in drive A, and with the null modem device connected. The null modem device adds a bitbanger device which is used to send and receive serial data, and requires a filename to send to or receive from. MESS allows sockets to be specified as files, so these can be used to facilitate a connection between MESS and other programs or even another instance of MESS. Sockets are specified by using 'socket.<IP address>:<port>'. If the two MESS instances are running on the same system, then you can use 127.0.0.1 as the IP address. Port can be any unused port on your system, it's up to you. This connects the null modem to the second serial port (COM2 in DOS), as the mouse is usually connected to COM1. You can connect it to -board2:comat:serport0 if you want, but this will replace the mouse. Running MESS in a window is good idea, since there will be plenty of switching windows. If you haven't done so previously, make sure the BIOS setup for at386 is correct. Make sure the parameters for any hard disk you may have mounted are correct, and that you have at least drive A set as 3.5" 1.44MB. Now let it boot from floppy, pass the time settings (just press enter to accept the defaults), and you should be at the A:\> prompt. 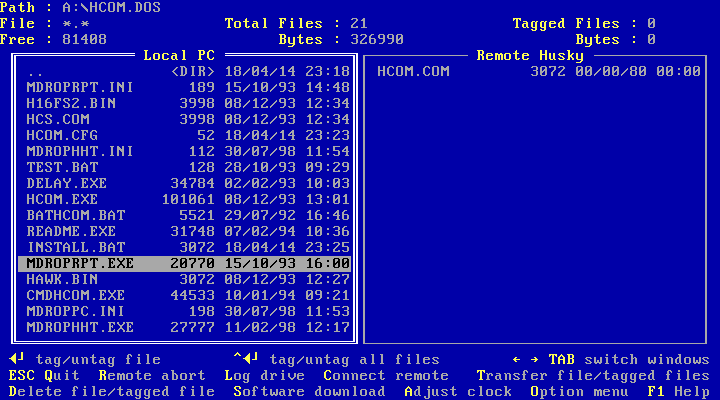 Type 'cd hcom.dos', and press enter. Step 2: Set up the Hunter 2. Start a second instance of MESS, running the Hunter 2 driver, with the same socket setting as for the PC driver. The IP address and port must match that used for the PC instance. If you haven't done so previously, you will need to format the battery-backed RAMdisk. Simply type 'format', and press 'y' when asked if you're sure. If you run HCOM now, you'll get a communications failure. This is because the Hunter currently lacks the software to communicate with HCOM. So, you'll have to download that to the Hunter. First you should check HCOM's options. Make sure that baud rate is set to 4800, and COM port is set to COM2. These should already be set for you, but do change them if not, and select 'Save Options'. You will need to exit and restart HCOM for changes to take effect. On the PC, running HCOM, press S to start a software download, select 'Husky Hunter', and HCOM will give you instructions what to do. 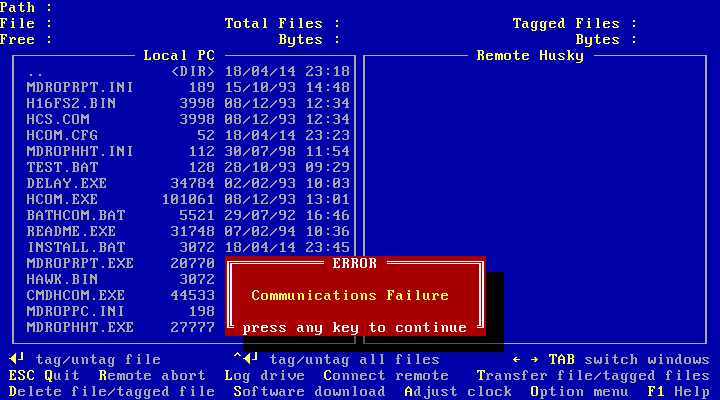 You will also need to set the bitbanger settings to match the baud rate expected to, so on both MESS instances, go to the Bitbanger Control menu and set the baud rate to 2400 (note that since MESS 0.153, bitbanger controls have been moved to the System Configuration menu, and there are two baud rate settings. Change both of these to 2400). Switch to the Hunter, and run 'coms', and set the communication settings to match what HCOM wants. Now type 'inp 999 hcom.com' and press enter. You will be greeted with the message "Waiting". Switch back to the PC, and press enter to start the software download. On the Hunter, the message "Loading" should appear. When the download is completed, switch to the Hunter, and press ESC (Shift-BRK, default mapping in MESS is Shift-Esc). Do a dir, and you should see HCOM.COM listed. Last edited by mahlemiut; 04/19/14 01:33 AM. First, we need to set the bitbanger baud rates again, this time to 4800, which is the maximum possible rate that the Hunter supports. So, open the MESS Bitbanger Control menu again, in both MESS instances, and set the baud rate to 4800. Switch to the instance running the Hunter, and type 'hcom' and press enter. This runs the control software that you just download from the PC. If all went well, it should run and wait for instructions. Switch back to the PC instance, and if you're still running HCOM, press 'c' to connect to the Hunter. The Hunter's directory contents should appear in the right-hand window, and the Hunter should display "connected". Now, you can select one or more files and transfer them between the two systems. Enter will select/de-select a file, and pressing 't' will transfer them. If the left-hand window is active, then files are sent to the Hunter, and if the right-hand window is active, then files are received from the Hunter. One more cool trick, is the ability of HCOM to synchronise the Hunter's clock with the PC. 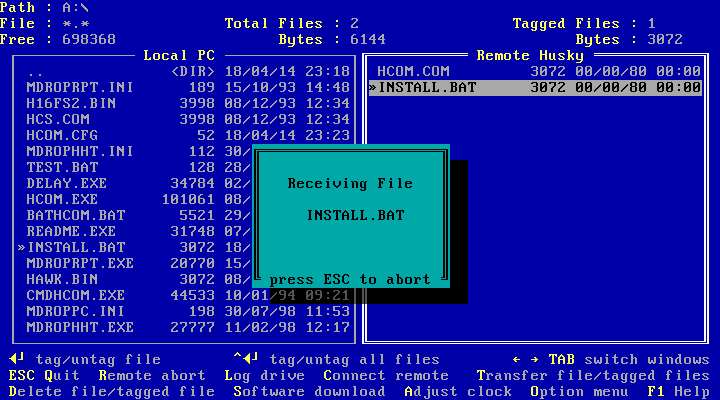 To do this, first switch to the Hunter, and exit hcom.com by pressing Shift-BRK, then run 'clck'. No need to set anything, just press enter to exit, this will mark the date/time as set by the system. Now run 'hcom' again. Switch to the PC, press 'c' to connect to the Hunter, and then press 'a' to adjust the Hunter's clock. No, it's not Y2K compatible. Since svn r29688 the bitbanger menu no longer exists, use the system configuration menu instead. It supports split transmit/receive baud rate now, so make sure you set both. It will save your settings all the time you load mess with the null_modem. Last edited by smf; 04/19/14 07:53 AM. The Hunter operates a virtual 40x8 window of a 80x25 screen, so you can move the viewable area by pressing Shift and the cursor keys. Last edited by mahlemiut; 04/20/14 02:29 AM. 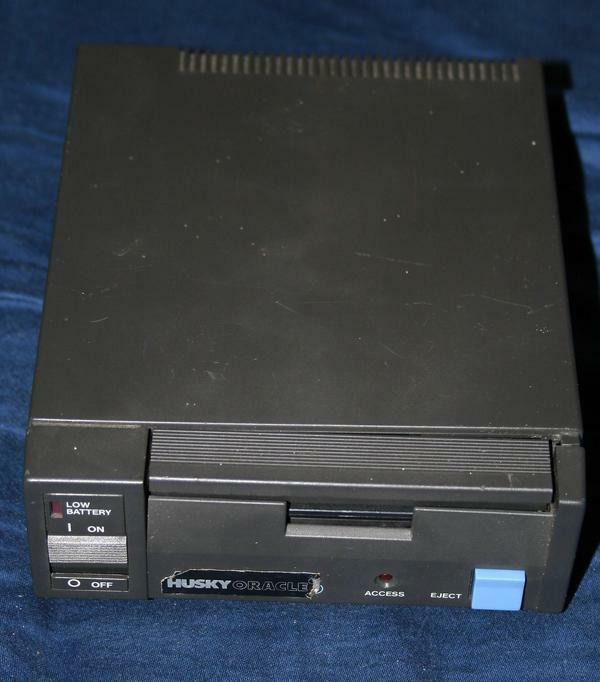 This battery powered 3.5" drive was connected to the 25pin RS232 port of the Hunter 2. 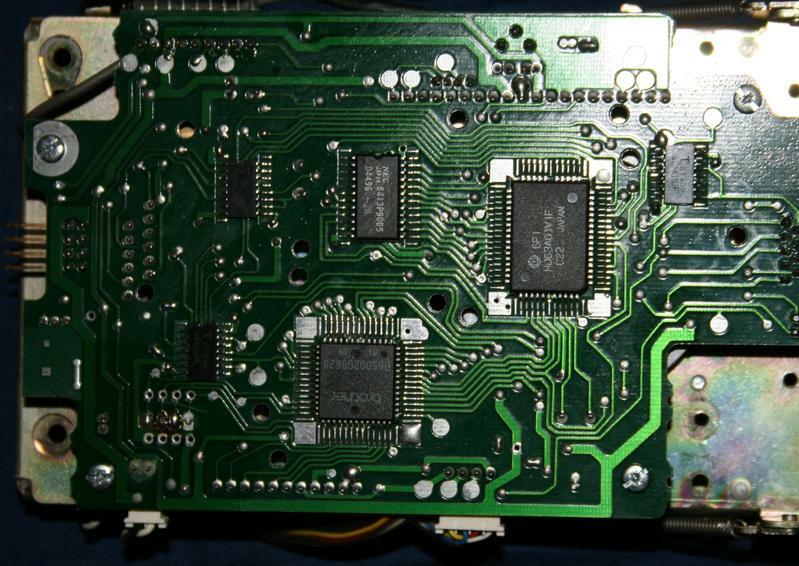 The later Hunter 16 machines are mentioned with a more advanced version, the "Oracle GT"
The controller board features a HD63A01 CPU, and the Tandy folks have managed to read its internal ROM and document the protocol. The archive on the FTP and here includes the photos from my Husky branded drive, Tandy and Brother documentation and the Tandy ROM.